Vice President Mike Pence spoke in New Hampshire Thursday on behalf of Gov. Chris Sununu's re-election campaign. Vice President Mike Pence visited New Hampshire to discuss the Trump administration's tax plan and speak at a fundraiser for Republican Gov. Chris Sununu's 2018 re-election campaign. 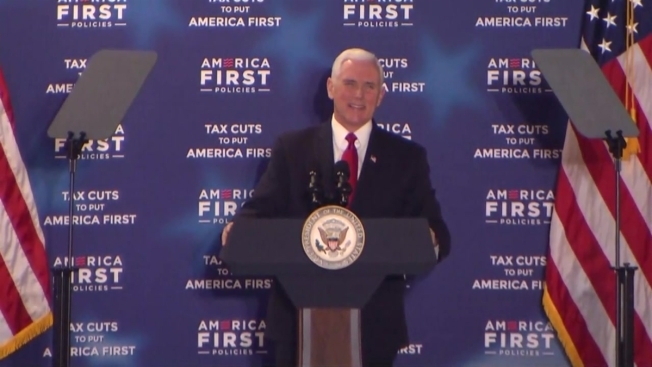 Pence spoke Thursday afternoon at Manchester Downtown Hotel as part of a series called "Tax Cuts to Put America First." America First Policies is a nonprofit organization that promotes President Donald Trump's policies. Pence's visit comes three days after Trump stopped in Manchester to discuss policies to combat the opioid crisis, including his plan for punishments such as the death penalty for those caught trafficking highly addictive drugs. Sununu has strong approval ratings in recent polls.